Tapping the patellar tendon elicits the knee jerk (L 2,3,4), a stretch reflex of the quadriceps femoris muscle, because the tap on the tendon stretches the muscle. A similar contraction is observed if the quadriceps is stretched manually. When a skeletal muscle with an intact nerve supply is stretched suddenly, it contracts. This response is called the stretch reflex. It is a type of monosynaptic reflex. Absence of the knee jerk can signify an abnormality anywhere within the reflex arc, including the muscle spindle, the Ia afferent nerve fibers, or the motor neurons to the quadriceps muscle. 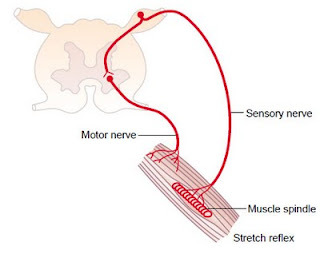 In general the afferent loop is much more critical for reflex function than the efferent loop, so that unless the muscle is almost paralysed, loss of reflexes suggests a sensory nerve or root lesion rather than a motor nerve lesion. The most common cause is a peripheral neuropathy from such things as diabetes, alcoholism, and toxins. 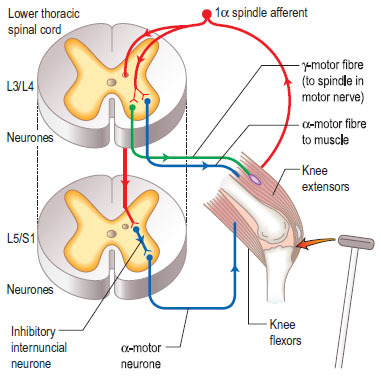 Increased tendon reflex activity suggests increased excitability of the anterior horn cells in the spinal segment of the stretched muscle due to loss of descending inhibition with a UMN or corticospinal tract lesion. Brisk reflexes alone, however, are not necessarily pathological and usually result from anxiety. In hypothyroidism both the contraction and the relaxation phases of the tendon reflex may be prolonged, resulting in 'hung-up' reflexes. In cerebellar ataxia the reflexes may be 'pendular': there are oscillatory limb movements after the initial reflex associated with 'loose' tone.